Will I have a bus stop near my house next year? Decisions on bus routes for the 2015-2016 school year will be made in the late spring at the earliest. Know that we try our best to cluster bus stops in a way that accommodates as many families as we can, though this is a challenge for a new and growing school. One of the most exciting aspects of our community is that it is extremely geographically diverse. Our students come from Battery Park City, the Upper East Side, Brighton Beach, Flushing and everywhere in between. Our current bus routes, which cover Manhattan, Brooklyn, and Queens, are subject to change next year based on enrollment. Whether it is via our school bus or via carpooling, all of our current students are arriving to school each morning safely and comfortably! There are ways you can help improve the likeliness to have a bus stop close to where you live. Share the news about BASIS Independent Brooklyn with your neighbors! You’ll even get a discount on tuition. What is your projected enrollment count for the 2015-2016 school year? The Regular Admissions deadline is January 16, 2015. What happens if I miss it? We’ve received panicked calls from families who have just recently learned about our school and are worried about fulfilling application requirements in time. We highly encourage you to submit your application by the deadline of January 16, 2015 to ensure your child will have the best chance of being offered a seat at BASIS Independent Brooklyn. You will have until January 28, 2015 to submit the requirements for a complete application profile. Don’t delay – submit today! How do you handle new students coming into BASIS Independent Brooklyn who haven’t been in an accelerated program or haven’t taken certain subjects like Latin, Mandarin, or the three sciences in 6th grade? We take pride in ensuring students from a variety of preparedness levels and educational backgrounds have a smooth transition into our program. 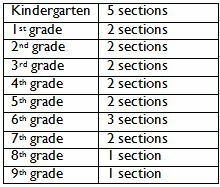 For foreign language, it is likely that we will have multiple sections to account for level. Additionally, much of our curriculum is spiraling; topics touched upon in 6th grade chemistry, for example, are revisited and explored in greater depth in 7th grade. If necessary, we will enroll students in our Student Support program, which is specifically designed to help supplement classroom learning with one on one or small group work with our teachers, all with the goal of ensuring academic success. It is exciting to see how quickly students adapt to our program and how little time it takes for them to feel successful, regardless of their educational history. When are you releasing the 2015-2016 school year calendar? The first day of school will be September 8, 2015. The full calendar will be released in February.